Please Note: This article does not apply if we currently remotely host your MIDAS in the "cloud", as an Annual Support Subscription (and therefore updates) is included as part of your annual hosting. An Annual Support Subscription entitles customers to both types of updates for the duration of their subscription. If you purchase MIDAS without an Annual Support Subscription, you will only be entitled to receive interim bug-fix updates for the version of MIDAS which is current at time of purchase. Once the next "feature rich" version of MIDAS is released, you will then no longer receive interim updates to your MIDAS and will not be able to update to the new major release. For example, if when you purchase MIDAS without an Annual Support Subscription, the latest version is v4.08, you will only be entitled to receive interim bug-fix updates for v4.08. Once v4.09 is released, updates to v4.08 will cease. In the case of having an Annual Support Subscription which then expires and isn't subsequently renewed, you will only continue to receive interim bug-fix updates for the latest version of MIDAS available on the date your subscription expired, and these updates will cease once a newer major version is released. For example, if when you purchase MIDAS with an Annual Support Subscription, the latest version is v4.08, and within the 12 month period your subscription is valid for, v4.09, v4.10, v4.11, and v4.12 are also released you will be able to update to all of them. If then on the day after your Annual Support Subscription expires v4.13 is released, you will not be able to update to this release, and will remain on v4.12 which will no longer receive updates. All the above principles also apply to any optional addons you may have purchased for your MIDAS. If you do not have an Annual Support Subscription, you will not receive further updates to addons once a newer major version of MIDAS is released. For these reasons, we strongly advise that you consider taking out and maintaining an Annual Support Subscription for your MIDAS. Not only will this ensure that you're always able to run the very latest version of MIDAS available, with new features and fixes, but you'll also have access to our Priority Support service too! 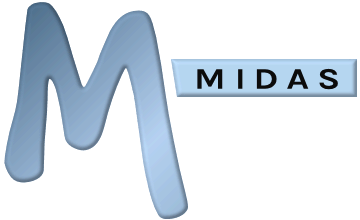 What happens if I fail to renew my MIDAS subscription? How can I renew my MIDAS subscription?